The Netflix stock price dropped 6.87% yesterday (Wednesday) over concerns of slowing user growth. ITG Research projected yesterday that Netflix Inc. (Nasdaq: NFLX) will only add 1.13 million new domestic subscribers for Q4 2015. This is below Netflix's previous estimates of 1.3 million. And because of that slowing user growth, ITG changed its domestic revenue projections from $1.265 billion to $1.251 billion. But despite the downgrade in domestic revenue, Money Morning is very bullish on the Netflix stock price today. You see, the sell-off of NFLX stock yesterday is a major overreaction, and investors are missing the bigger picture. While slowing domestic user growth is disappointing, Netflix has grown into a global company. And Money Morning Defense & Tech Specialist Michael A. Robinson says Netflix is on its way to becoming the preeminent provider of content throughout the world. "Right now, they are going through an Amazon.com Inc. (Nasdaq: AMZN) style growth period. It's the Bezos model – build, build, build – then the profits will follow," Robinson stated after Netflix's Q3 2015 earnings report. The company also beat international growth expectations in its last earnings report, adding 2.71 million subscribers instead of the expected 2.4 million. During a Q3 earnings call, CEO Reed Hastings explained the source for this impressive user growth. "The consumers can watch when they want, on what type of device they want, and the content has just got better and better," Hastings said. But Wall Street isn't focusing on the total growth. And that's why the Netflix stock price is dropping this week. That volatility also highlights why NFLX stock is not a good investment for the short term. "If you can hang in and go through any volatility, you can be okay with Netflix stock long term," Robinson said. At the Consumer Electronics Show 2016 last week, Hastings announced that Netflix will be available in 130 new countries. International streaming subscriber totals (25.99 million) are about half of Netflix's 43.18 million domestic subscribers, but that only means there is still plenty of opportunities for growth. 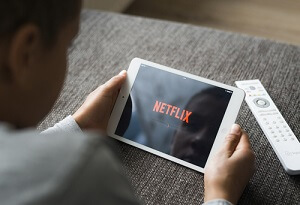 Entering a new market is a huge catalyst for user growth, and Netflix has a plan for attracting new users both internationally and domestically. Last year, Netflix produced a total of 16 scripted series. For 2016, Netflix plans to nearly double that number to 31 scripted series. These original programs help Netflix set itself apart from competitors like Amazon's streaming video service and Hulu. It cost Netflix over $100 million to produce two seasons of "House of Cards." But Netflix only needs to add roughly half a million users to cover the costs of producing the show, according to The Wire. Even with this week's drop, the Netflix stock price is up 130% in the last 12 months. The Bottom Line: The Netflix stock price will be volatile because of Wall Street's overreactions, so this is not a stock that short-term investors want to own. But international growth and increased original programming both make NFLX stock a great addition to portfolios for the long term.